"Research languages" which are meant to demonstrate or test a hypothesis. In the current world, English most often serves the function as an auxiliary language, with French, Spanish, German, Hindustani (Hindi/Urdu), Arabic, Malay, and Russian often serving as well, even between populations that do not normally speak these languages or any related ones. Sorry, but the confusion of different languages is God's will. A variety of languages have served as international vehicles for communication or trade. Some of these are simply natural languages that have been pared down or simplified, such as the various forms of pidgin English . Some of these languages have turned into natural languages in their own right; from pidgin English the Tok Pisin language was born. Another famous international trade language is the Mediterranean Lingua Franca , spoken through the western Mediterranean from the 11th to the 19th centuries. These natural auxiliary languages are frequently based on widely spoken language groups; Romance languages formed the basis of the Mediterranean Lingua Franca. Similarly, the widespread Swahili of East Africa is a somewhat simplified version of the Bantu languages with many borrowed Arabic words. In southwestern Africa, simplified or creolized versions of Lingala and Kikongo serve similar purposes. But most proposals for auxiliary languages involve newly constructed languages offered by their promoters specifically for international use. In Diderot's Encyclopédie, one contributor to the article on "Language" suggested that a simplified version of French should be posited as an international language. Another interesting early proposal was Solresol , developed by François Sudre in 1827. This language limited its syllables to the solfege tones of the musical scale. This enabled the language to be sung or represented as pure music in addition to spoken syllables. John Wilkins' An Essay towards a Real Character and a Philosophical Language was an early (1668) proposal for a set of characters that would serve as an auxiliary language. The creators of specifically auxiliary languages often have specific goals in mind that frequently border on utopianism. International institutions such as the United Nations or the European Union spend a great deal of time and money on translators. If every participant in their deliberations spoke a single language, it is argued, their deliberations might be more efficient. The idea that an international language would stimulate international trade is often put forth. Convenience for travelers and tourists is also another aim that proponents of auxiliary languages hope to advance. Voltaire called the fact that he needed an interpreter when he traveled from one mountain valley in Switzerland to another a "scourge", and dreamt of unifying all under a common language. The founder of the Bahá'í Faith, Baha'ullah, hoped for "one language that may be spread universally among the people... in order that this universal language may eliminate misunderstandings from among mankind." In Human, All Too Human, Friedrich Nietzsche prophesied a future language that would unite the entire human race. French critic Octave Mirbeau called a universal language a "great step forward" for civilization. Herbert Spencer wrote in his autobiography that "it seemes to me quite possible, probable even, that an artificial language to be universally used will be agreed upon." Maxim Gorky said that "Mankind would realize far faster the community of its interests if it spoke a single language." Even the more successful projects often carry a whiff of utopianism or crankery about them. For instance, the standard dictionary of Esperanto, the Plena Ilustrita Vortaro de Esperanto (Complete Illustrated Dictionary of Esperanto), is published by the Sennacieca Asocio Tutmonda (roughly, "Worldwide Anationalist Association"), a left-wing cultural organization of Esperantists whose stated goal is to promote an ideology of anationalism , the goal of the abolition of separate nation-states. There is also abiding tension in the Esperanto movement between users who accept the old and original goals of promoting the unity of humankind with a single language and similar political goals, versus those who simply find the language interesting. Those who subscribe to the aspirational goals of universal Esperanto use and universal solidarity are known in the Esperanto community as finvenkistoj , those who seek a 'final conquest' of the world of language by Esperanto. These finvenkistoj often subscribe to the interna ideo ("inner idea") of Esperanto, which involves removing barriers between people in order to promote universal brotherhood. During the years after World War II, Esperanto sought to propagate itself via new international organizations like the United Nations. This meant attempting to cultivate political leaders and win them to the cause of an auxiliary language. Largely as a result, the Esperanto movement sometimes criticizes stranguloj, "strange, odd, or peculiar people"; they'd be called 'cranks' in English. These are people who want to associate advocacy of Esperanto with other minority causes such as vegetarianism, nudism, religious zealotry, or similar causes. They may also try to advertise the language with eccentricities of dress. They are often suspected of attaching themselves to the Esperanto movement to use it to promote these other enthusiasms. The perception seems to be that studying Esperanto is eccentric enough, and the movement does not benefit from further manifestations of conspicuous oddness. A Volapük badge. The motto Menad bal, pük bal means "One human race - one speech". The first proposal for a international language that became anything like a mass movement was Volapük, first promulgated in 1879 by Johann Martin Schleyer, a Roman Catholic priest in Germany. Schleyer's language prefigured most of the subsequent proposals in a number of ways. Volapük had a lexicon derived haphazardly from the major European languages of the time, including English and French. It had a strongly agglutinative character that borders on the polysynthetic , with morphemes bearing fixed meanings that could be used at will. älöfol 'you have loved', löfolok 'you love yourself', palöfolöd 'go and be loved', puilöfotoföv 'if she will have always been loved', ulöfofs-öz, 'I charge you ladies to have loved by a certain time'. Agglutination also allowed the application of tense to nouns: adelo today, odelo tomorrow, udelo the day after tomorrow, ädelo yesterday, edelo the day before yesterday, idelo three days ago. These complexities meant that learning Volapük was something of a strain on the memory. Volapük's heyday lasted less than ten years; in 1887 the first book in Esperanto was published, and Esperanto rapidly overtook the difficult and complex Volapük as the chief candidate for an international auxiliary language. In 1931, Arie de Jong undertook a radical simplification of the original Volapük grammar, but his simplification was too little, too late and failed to save the movement. 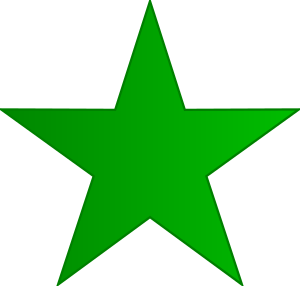 The green star, symbol of the Esperanto movement. Volapük's support base collapsed rapidly upon the proposal of a new international language, Esperanto. Esperanto was the creation of L. L. Zamenhof, a Polish and Jewish ophthalmologist in the then Russian Empire, who published the Unua Libro ("First Book") in 1887 under the pseudonym Doktoro Esperanto ("Hopeful Doctor"). Originally and unoriginally styled simply Lingvo Internacia, the language took the name Esperanto from Zamenhof's pen name. “”Per preteksto de religio, afrikanoj estis sklavigitaj por labori en kampoj de tabako kaj kotono. The rapid replacement of Volapük by Esperanto illustrates one constant dynamic of the international auxiliary language community. Everybody interested in your project has several ideas that in their opinion would make it even better. The debates between Esperantists and Idists set the tone for a debate concerning what form a perfect auxiliary language would take. Esperantists argue, with some justification, that actually using the auxiliary language is a more important goal than perfecting it; natural languages are full of irregularities and hard patches, yet some of them have served as international lingua francas in the past. The dynamic between arbitrary coinages in the lexicon and inflections, versus words that are easily recognized by educated Westerners, is one breaking point. As with Latin itself, there is some uncertainty about pronunciation issues such as stressed syllables and the realization of palatal consonants. “”Nostr patr kel es in sieli! These all tend to be cut from the same cloth, as these examples make clear. They illustrate the fissiparous tendency of the makers of auxiliary languages. Each creator imagines that their predecessors were on to something, but that further tweaks were needed in order to finally get to global acceptance, and each author knew what those tweaks were and how to bring them about. kako v nebě tako i na zemji. Like Interlingua, these zonal auxiliary languages aim at maximum intelligibility to readers of languages of a specific family. For English speakers, Basic English feels like a straightjacket. It accepts as transparent dozens of English idioms and verbs with vast breadth of meaning (keep holy), whose meanings may not be immediately obvious to non-native speakers. Basic English lives on in projects such as the Voice of America's broadcasts in 'Simple English', and as such has come closest to an auxiliary language at getting the support of a government. Basic English also preserves all of the random irregularities of English spelling, and the many English irregular verbs, which have often been urged as an objection to the use of English as an auxiliary language. Interlingua, like Esperanto before it, obviously privileges Europeans and especially speakers of Romance languages; it offers no additional ease of acquisition to anyone speaking an Asian language, and little more to Slavs and Germans. Other proponents of auxiliary languages take great steps in the opposite direction. The Toki Pona lexicon is drawn from many sources. Toki Pona also somewhat resembles Suma, a "1000 word" international language first published in 1957: suma te kana nato sako = "Suma be/is/was easy world language". in suda asi in buba. From the foregoing, a number of problems in the nature of the enterprise become apparent. The proposals are all full of hope about how a neutral international language would ease communication and achieve world peace. There is no significant agreement, though, on what features such a neutral language would have. Some seek stronger neutrality by making entirely arbitrary lexicons. Others abandon neutrality in favor of a culturally marked general European lexicon, often with the observation that genuine cultural neutrality is impossible. The people who take first notice and interest in these proposals are generally language hobbyists themselves. This means that each new proposal will be greeted by a passel of critics who think they have a better way. The movements that have survived will acquire a dose of fundamentalism to keep this fractious tendency in check. Esperantists will argue that it's more important to use Esperanto than to seek to make a more perfect version of Esperanto. This dogmatic tendency has kept the Esperanto movement coherent despite the flaws that many perceive in the language. It has also made the quarrels of the auxiliary language community anathema among language construction hobbyists. In one sense, the Esperantists are right. Picking and using a second language for communication across language barriers is more important than constantly striving to perfect a better one. Of the several artificial languages proposed for auxiliary use, Esperanto easily has the largest installed user base. It is possible to go to conventions and visit places where people are actually speaking Esperanto to one another. You aren't going to get that with Novial or even Interlingua. The various objections to Esperanto's grammar and phonology apply with equal force to many natural languages. Of course, this overlooks the 900 pound gorilla in the room. The world's second language is already English. English has achieved this status despite many reasonable objections, including a difficult phonology, notoriously difficult spelling, and many irregular verbs. More than half of the world's websites are in English; it dwarfs the runner-up, Russian, by around 45 percentage points (Esperanto currently is the most frequently encountered artificial language. It ranks between Luxembourgish and Twi.) Even those who object to the dominance of English as the product of European and American cultural and political power use it because it's there. Members of the Cherokee people know that the key to keeping their language alive is to teach it to children. The forced regularities and deliberate simplifications of the artificial auxiliary languages serve one purpose alone: they make the languages easier to acquire for adults. They reduce the burden of remembering grammatical features. But whatever language is chosen, adults should not be the targets. These adults are past the prime years for language learning. And children in those prime years adapt to the irregularities and grammatical complications of natural languages without much trouble. If you speak Russian, you speak a language that's as complicated as Latin; if you speak Cree, your language is even more complex than Ancient Greek. The trick is to learn them before adolescence. Most of the design features that the auxlangers argue about wouldn't matter anyways. If any such language escaped the world of typed text and found a home in human tongues, it would become susceptible to the sorts of random drift and phonetic changes that all natural languages are subject to. This real-time usage would smooth away planned features. Sound sets may be simplified, or may be complicated. Fresh colloquial irregularities will arise. Local dialects will arise. A successful planned auxiliary language would soon become hard to distinguish from natural languages. Adoption, of course, would potentially be an even greater tragedy than the bulldozing of Native American languages by English, Spanish, and Portuguese in the New World. If any such proposal achieved the critical mass needed to achieve its stated goals of world-wide currency, all of the world's natural languages would be threatened. Writers, advertisers, and filmmakers would compare the audience for works created in the new language, versus the audience reached by existing languages. It would be in their economic interest to cater exclusively to the world-language audience. “”le xisyctu jdaselsku be la jegvon. .i le do nobli turni be la ter. ku se cfari. Wil nosha’ad sha Natha lenedi. Yet another language which attempts to remove ambiguity in syntax is Ithkuil, which succeeds only in its ability to be even more complex than Lojban. You're Learning Russian or Latin, and you think 7 cases are hard? Try 92. (!) Studying Georgian and struggling with the complicated phonology? In its original form Ithkuil had 65 consonants and 17 vowels, with the revised version having 45 consonants and 13 vowels. An opposing faction of language constructors, who call themselves "artlangers", prefers languages like Klingon, Quenya, Na'vi, and Brithenig, where nobody has a political dog in the fight, but people just appreciate them as works of art on their own. These languages are created by their inventors for artistic and literary reasons, and make no pretense of being easy to acquire or useful as a medium of intercommunication. Farewell to auxiliary languages and Optimal auxiliary language design by conlanger Rick Harrison; these two essays discuss the extensive issues involved with creation and acceptance of any auxlang. Edward Sapir, Wanted: A World Language - From The American Mercury, Feb. 1931. J. R. R. Tolkien, A Philologist on Esperanto. The British Esperantist, 1932. ↑ This is the beginning of the Lord's Prayer in the original Volapük. Samples that follow will be the Lord's Prayer unless otherwise indicated. This text has been chosen because it is one that has often been translated by the creators or proponents of these languages. ↑ "Idistoj" is Esperanto for "Idists", speakers/supporters of Ido. ↑ 1.0 1.1 1.2 1.3 1.4 1.5 Mario Pei, One Language for the World (Biblo & Tannen, New York; 1968), pp. 48-52. ↑ 3.0 3.1 3.2 Peter F. Glover, The Esperanto Movement (De Gruyter, 1982; ISBN 9027933995), pp. 135-137. ↑ La interna ideo de Esperanto... estas: sur neŭtrala lingva fundamento forigi la murojn inter la gentoj kaj alkutimigadi la homojn, ke ĉiu el ili vidu en sia proksimulo nur homon kaj fraton. ("The inner idea of Esperanto... is: upon the foundation of a neutral language, to cast down the walls among peoples, and to accustom humans to see in their neighbor only a person and a brother.") L. L. Zamenhof, Speech to the 8th Esperanto Congress, Krakow, 1912. ↑ See the Wikipedia article on Esperanto profanity. ↑ The Lord's Prayer (Matthew 6:9-15), The Bible in Basic English. ↑ Suma, Esperanto Wikipedia (in Esperanto). ↑ Edwin Powell Foster, Dictionary of Ro (1919). ↑ Rick Harrison, farewell to auxiliary languages, 24 Feb 1997. ↑ Usage of content languages for websites, w3techs]. ↑ Cognitive Benefits of Learning Language, American Council on the Teaching of Foreign Languages. ↑ Robin Lee Powell, Lojban: You're Doing It Wrong. ↑ Suzette Haden Elgin, A First Dictionary and Grammar of Láadan, Second Edition(Madison: Society for the Furtherance and Study of Fantasy and Science Fiction, 1988). ↑ Nuirn and Vandalic are respectively Germanic and Romance artistic languages made by your present author. This page was last modified on 27 March 2018, at 16:28.